A short news story on the radio this morning was covering the USS Hornet and its role in recovering the Apollo 11 and 12 space missions. The Hornet is permanently docked here in the SF Bay Area in Alameda, but I haven't yet seen it. Starting this weekend the museum is hosting Splashdown! with various celebrations all week long. 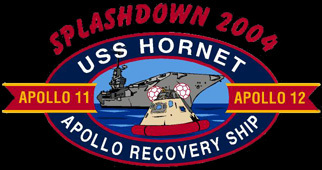 The USS Hornet Museum will be hosting a festival July 16-25, 2004, to commemorate the 35th anniversary of NASA’s Apollo 11 and 12 flights, which landed the first humans on the moon. As the primary recovery vessel for these historic missions, the USS Hornet played an important role in the Apollo space program. The Museum will be opening two new exhibits showcasing Hornet’s role as well as other spacecraft recovery missions performed by the US Navy supporting Mercury, Gemini, Skylab and Soyuz launches.